Home > ANB Blogs > Make Your Own Flu Fighter Potion and Prevent Viral Invasion! 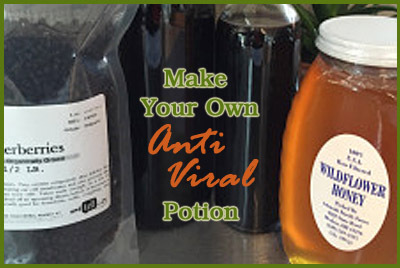 Make Your Own Flu Fighter Potion and Prevent Viral Invasion! Since I believe health encompasses much more than just skincare, I bring a great resource to your kitchen and invite you to naturally strengthen your immune system this winter! The kids are back to school, the weather is turning cold, viruses are getting rampant and our immune system is taking a hit. Just this past week, a personal friend and pediatric physician reported he saw over 60 patients in one day with viral related issues. 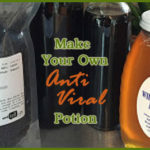 THE TIME IS NOW TO CREATE YOUR OWN HEALTH PLAN- AND HEALTH POTION! Elderberry could quite possibly be the most perfect flu-season berry. After all, elderberries contain compounds that inhibit the flu virus enzyme from even penetrating the cell membrane. If the virus is unable to penetrate the cell wall, the virus will not be able to replicate and you are left with your health intact. Once penetration occurs, rapid replication of the virus occurs. Symptoms will be mild and often display as vague, as the immune system attempts to conquer the viral load. Because the flu virus is so potent and rapidly replicates, it easily overtakes the immune system very quickly. BUT… if you can prevent viral-cell penetration, you can beat the flu even before you know it has arrived at your membranes! I know all about cellular function. By education and practice, my Nursing Anesthesia career is built upon lipid soluble drugs that pass through the cell membrane to induce anesthetic sleep. I understand the ramifications that occur when unwanted toxins (a virus is a toxin), penetrates the cell membrane and causes damage. My skincare line, Primal Life Organics was built upon this knowledge. Once inside a cell, the intruder becomes one with the cell and can even destroy or mutate the DNA of the cell. Sickness, cancer, endocrine disruption, altered immune function and inflammations can all be the result of cellular invasion of any kind (viral, chemical, toxin) whether from the environment (flu or skincare) or food. So, I made my skincare products to improve my health. I want a strong immune system to help fight any uncontrollable and random exposures to chemicals and viruses. By feeding my skin and body the nutrients that support a healthy cell wall membrane, I increase the chances that my cells will prevent invasion by foreign substances. If by chance the substance does penetrate, my body is functioning optimally and has better defenses for neutralizing and eliminating the source with minimal insult. But when flu season hits, I want extra protection! I trust my cell membranes, however, I know how strong the viral infestation can be and because of this, I go above and beyond the normal, everyday vitamins, probiotics, fish oil and kombucha. Elderberries are little powerhouses- take advantage of what they do! Since they inhibit cellular membrane penetration from the flu virus, they therefore prevent invasion of the respiratory tract cells. Elderberries are especially great for preventing bronchitis, colds, coughs and influenza! Before I give you my Simple and Easy Flu Fighter Potion, you should know what elderberries contain! They are loaded with vitamin C, antioxidants, potassium, beta-carotene, calcium, and phosphorus Elderberries also contain natural substances called flavonoids which help reduce swelling, fight inflammation, and boost the immune system. What do you have to lose- beside a week home with the flu! In a saucepan, bring berries and water to a boil. Reduce heat and let simmer for one hour. You can also make in a crockpot, set on a medium setting. Remove from heat and let cool for 15 minutes. Strain elderberries from liquid. Let juice cool to room temperature, or place in the fridge. DO NOT ADD HONEY TO HOT LIQUID (the heat could destroy the beneficial nutrients of the honey). At first sign of any symptoms, increase intake. I take a dose every 2-3 hours until symptoms subside. If my kids get sick, I increase everyone’s dose to 3-4 times a day. I cannot say you will not get sick, but I believe in prevention. If I give my immune system the tools it needs to function properly, quite possibly, an infestation might not occur, or at least not be as powerful! 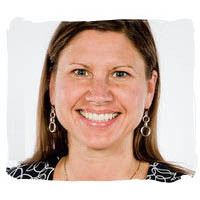 Trina is the founder and owner of Primal Life Organics.